Our General Studies program is predicated on the very values that define our school. The same approach of love, warmth, encouragement, and positivity that are the hallmarks of the kodesh program permeate the General Studies program as well. Our program is built upon the understanding that excellence breeds excellence, with our superior General Studies education complementing the high quality kodesh education of our morning program. We bring each of our students to realize his potential, challenging each boy on his level to continue growing and striving. At Yeshiva Ketana Ohr Reuven, we recognize that a General Studies program is more than a preparatory program for employment. We train our boys to be full-fledged members of the Jewish community and the broader world, educated, knowledgeable and sophisticated enough to participate fully in society. We expect that our graduates will one day be leaders in their chosen fields while also serving as role models within the Jewish community. We are also fully cognizant of the fact that in our ever-changing and growing economy, we are educating our elementary-school students to succeed in careers that likely have yet to be invented. In that vein, we strive to imbue our students with a broad base of knowledge in Mathematics, Language Arts, Science, Social Studies, and computers, skills that will serve them well in any profession. In addition, we place strong emphasis on critical thinking and response, honing our students’ minds in the crucial areas of higher order thinking and analysis. At Yeshiva Ketana Ohr Reuven, we take great pride in a teaching faculty that is unparalleled in skill, professionalism and caring. Our teachers are all highly educated in their fields and bring all of their great talent and ability to the classroom each and every day. Our classrooms are environments of excitement, enthusiasm, and interactive learning and growth. Our younger elementary grades are enhanced by the presence of an assistant teacher in the classroom as well, providing an extra set of eyes, ears, and hands to make sure that all of our students get the attention they need in these crucial, formative years. The YKOR staff is growth oriented and our staff spends much time together during the course of our school year focusing on professional development and growth. Our elementary program builds the foundation of knowledge and skills that will serve as the basis for all future learning. Beginning mathematics, starting with counting and going through to addition, subtraction, multiplication, and division are taught and reviewed to ensure that our students are well prepared. Our reading program takes our students all the way from basic phonics through to comprehension and higher order thinking. The elementary students explore and discover the world around them through a social studies curriculum that focuses on community and society and a science program that emphasizes hands-on learning and exploration. The middle-school further expands upon that foundation, stimulating our students in a departmentalized program that emphasizes each of the core subject areas. In addition, our middle-school students are offered the option of honors level work in each of their classes as part of our Middle School Academic Honors Program. Our middle-school honors students complete independent research projects in their chosen honors classes and, at times, are offered advanced seminars in specific subject areas. Our middle-school students are also nominated and elected monthly for our middle-school honor roll which recognizes boys not for academic achievement, but for exemplary conduct and effort in and out of the classroom, thereby reinforcing the core values that we attempt to inculcate in our students. Our school-wide Principal’s Reading Club encourages and rewards students for time spent reading throughout the year. Students are given special Reading Club bookmarks which they can use while they read and then record their monthly reading times to be part of the club. Club members’ names are prominently displayed each month on our bulletin board across from the front office. 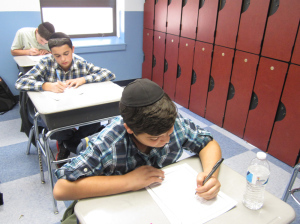 The students of Yeshiva Ketana Ohr Reuven are invited and encouraged to participate in twice-yearly school-wide writing competitions. The fall contest, a creative writing challenge, awards a first, second, and third place prize to each of our elementary and middle-school divisions. The spring contest focuses on poetry in celebration of national poetry month, each year highlighting a different poetic genre, and offers the same incentives and awards as our fall contest. We also drive our students to exercise their memories, challenging them to commit to memory certain vital historical documents and speeches such as the Gettysburg address and the preamble to the United States Constitution. Students are offered rewards and incentives for these contests as well. One of the highlights of the academic year is the annual academic fair which usual takes place on Presidents’ Day. Each year, the fair focuses on a different area, guiding the students through a specific, detailed set of requirements for their fair project. We have run science fairs, countries fairs, biographies fairs etc. The fairs give the students the opportunity to highlight their unique talents and skills while displaying their work. As part of our General Studies Program, we also recognize the length of the school year and the need to spice up our program with some variety throughout the year. We have run school-wide Color-War competitions focusing on academic, athletic, and artistic competition, affording our students the opportunity to learn, grow, and shine in an environment of low-pressure and fun. Class trips to destinations related to our areas of study help students see with their own eyes what they have studied in school and help form memories that will last a lifetime. In addition, we periodically bring in guest speakers and presenters, who expand our students’ horizons, mesmerizing them with amazing science experiments, captivating them with personal recollections of the Holocaust, and training them in the skills and techniques that they can employ to become better, more successful students. Each academic year culminates with the publication of an anthology of student writing on a specific topic. We have covered topics such as Challenges and Beginnings, prompting our students to compose a deep, insightful and well written response to these thought- provoking topics. The publication is always an enjoyable read and highlights the progression of our students year over year as they move through our program.